I’ve been spending a lot of time in my kitchen cooking with 6 of my favorite spices and have shared the following recipes with you: Strawberry/Lime/Cardamom Salad, Chai Quick Bread, Make Your Own Taco Seasoning, Chocolate Chipotle Brownies, Cumin Potatoes, White Chili, Orange Cardamom Muffins, Spicy Hummus and Snickerdoodle Chex Mix. I love the creating process but I’m not a big fan of what comes after. Yes, the dreaded clean-up process. What do you do with your spices when you’re not creating something yummy? How do you store your spices? In case you don’t have a spice storage system in place, don’t worry I’ve found 16 awesome ways others have organized their spice collections. Check them out! Oh, and if you missed my post introducing you to My Spice Sage you can find it here. This company is by far the best spice company I’ve come across and I think you’ll love them too! Party Thyme, Get your Grill - Grilled Doughnuts? « #HGTV #Fabric – Two Tutorials, a Review, and a Coupon! I can’t believe I had those casserole holders and threw them away several years ago. Arghh! All of those are cute ideas! Oh, what a great collection Marilyn. You know I saw some magnetic spice containers somewhere once, really cheap and do you think I can remember where it was? Oh well. I went for a dollar store holder thingy which is serving the purpose. Such terrific ideas. I need to pass this one on to my daughter who has storage problems. she hates all of her spices lines up on the counter! I love every one of these. Thanks for linking up on the Whatever Wednesday Linky Party. Oh, now I feel like organizing my spices! 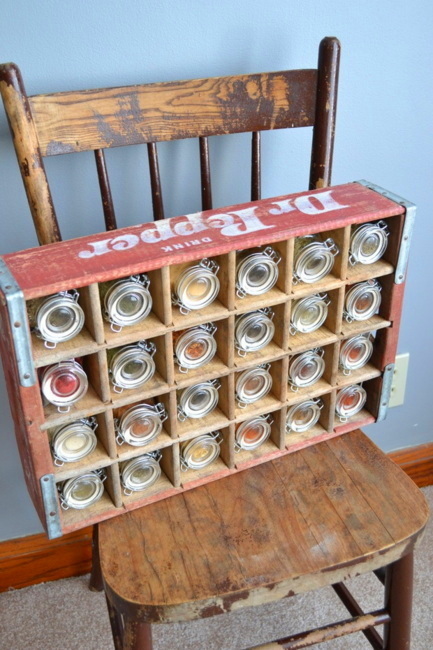 What a great round up of creative storage solutions! You have been featured on this week’s Creative Corner Hop. Thanks for sharing with us. Great ideas! I love my magnetic spice containers for Bed, Bath and beyond! Thanks for linking up at Romance on a dime!! I’m coming back to tell you again how much I love this round up Marilyn and that I’m featuring it at tomorrow’s party. Not long to go now for the Bday!